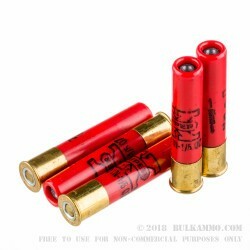 Moderately sized deer are no obstacle to this flat shooting, hard hitting .410 shotgun slug that features a hollow point and a rifled body. The true build purpose for this load was for moderate sized game hunting out of a small bore shotgun, but the other options exist because the ballistics on the round are so good. This premium Winchester Super-X rifled slug features a 1/5 ounce rifled slug that produces 1830 velocity out of the bore and offers excellent penetration out of a 2 ½” shell. 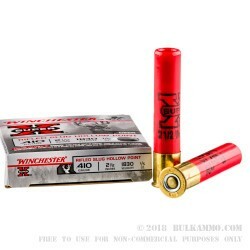 Combine with the great numbers you get from the ammunition, the build quality and the historical production reliability of the Winchester factory, the Super-X line and the specific attention to detail on this round, and you find that this is a legitimate lightweight deer round that gives superior placement, penetration and knock down power in a light weight platform (the .410 shotgun) and give you the much needed versatility you crave for deer season out of your favorite small bore shotgun. 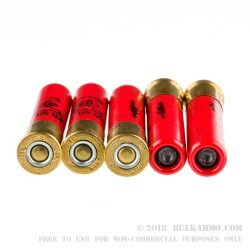 Suitable for use in any firearm that can chamber a .410 shotgun shell in 2 ½” length. This round is also reliable in semi-automatic shotguns. I tried out 3 different brands of .410 slugs (Federal, Remington, and Winchester) and these were the ones that produced the best results: Most accuracy, most penetration and most overall damage to the target.